Take #measure and #analytics ... two seemingly similar communities, one focusing on Web Analytics, one focusing on ... wait for it ... analytics!!! The difference in the communities is like night and day. The #measure community has 68 of 1,411 users that are "highly active". The #analytics community has 61 of 2,277 users that are "highly active". The #analytics community is not much of a community, in reality, with 1,716 of 2,277 participants tweeting only one time. This is a "broadcast community". Sometimes, simple segmentation schemes help us understand the dynamics surrounding a community. In both communities, there is a very small audience of core members producing all of the content, combined with a large population of broadcasters. Proportionately, the #measure community has more loyal users than does the #analytics community. Print Via Amazon, Click Here! Digital Via Kindle, Click Here! Hire Me For A Project, Click Here! It's been about a month since you were provided with twelve goals and objectives for 2011. Please review each objective, and comment on the progress you've made, year-to-date. Where are you making progress, where are you falling behind, and what resources do you need to complete each objective? As you know, you don't create objectives for the fun of it ... objectives are there for a reason, they are designed to push the business into the future, and they are designed to maximize profit. You don't forget about objectives, you review them month after month after month until you find a way to knock the door down and achieve them. Contact me (click here) for assistance as needed. Objective #1 = New Customers: On the existing marketing budget, increase the number of new customers by 15% in 2011. Objective #2 = Page Counts and Frequency: Through September 30, test alternate page counts, identifying the page count that yields the deepest circulation, most demand, most profit, and most new customers. Roll-out a strategy for 2012 that significantly decreases page counts to average and marginal customers while maintaining contact frequency. Objective #3 = Mobile: By June 30, implement a mobile app that is congruent with the lifestyle needs of your target customer. By December 31, accurately measure the impact this mobile app has on customer spend. Objective #4 = Social Media: Make social media the top objective for your customer service team, and for your marketing team. Require each marketing employee to spend 20 minutes each day maintaining a corporate Twitter presence, and capture every tweet from every individual who communicates with your employees, integrating that data into your customer data warehouse. By November 30, craft a plan for using social media as a customer service competitive advantage in 2012, based on what you learn about social media through November 30. Or, prove that Social Media is largely meaningless and does not contribute to the bottom line! Objective #5 = E-Mail and Search: Conduct database analyses that demonstrate how customers interact with catalogs, e-mail, and search. For instance, how many searches are driven by catalog mailings? Thoroughly know the role of each channel in the customer experience! By March 31, present findings to Executive Team, by April 30, present findings to every department in the company. By May 31, develop an integrated marketing plan that incorporates your findings. Objective #6 = Profit: Demonstrate that every employee in the marketing department is able to calculate profit by February 28. Assign one test in 2011 to every employee in the marketing department, requiring each employee to write up the results of the test, down to profitability. Share the results of each test with every employee in the company. Also, increase the profitability of all marketing activities by 15% in 2011 on the same level of ad spend. Objective #7 = Web Analytics: By December 31, link all website visits to existing customers in the customer data warehouse, and begin implementing website visitation behavior in all catalog and e-mail selections. If this cannot be done in-house, contact the folks at any large Web Analytics provider for tips and suggestions. Objective #8 = Benchmarking: Visit a non-competitive but similarly-sized catalog brand for a two-day "sharing session". Each party spends one day sharing how they review their business with the other party. Open and honest discussions are highly encouraged. Do this by April 30, 2011. Objective #9 = Succession Planning: Identify two individuals who are qualified to replace you, and create a plan for enhancing their odds of succession. Do this by March 31, 2011. Objective #10 = Catalog 2015: By October 31, 2011, craft a thesis called "Catalog 2015". Illustrate to the Executive Team where the future of catalog marketing is headed, what are the threats to the industry, what are the competitive advantages, and what is the likely contact strategy and new customer acquisition plan required to optimize catalog and online marketing in 2015. What are the demographics and geographic characteristics of your customer base? Will your customers be alive, or be in a prime spending cohort in 2015? What do you do if it costs 2.5x to 3x as much to mail a catalog in 2015 as it costs today? What do you do if mail delivery is limited to three days a week? What do you do if catalog productivity drops 30% in the next five years? What do you do if you have to have free shipping, all day, every day, 24/7/365? Share the future direction of catalog marketing and the response of our company to future challenges with every employee by December 31, 2011. Objective #11 = Discounts/Promotions: By February 15, demonstrate to every employee in the company what annual sales and annual profit would look like if all discounts and promotions were discontinued. Create a full-price profit and loss statement, and a discount/promo profit and loss statement, on an annual basis. Objective #12 = Merchandise: By June 30, thoroughly understand the items that must be featured on the home page, on key landing pages, in e-mail campaigns, and in the first twenty pages of every catalog, in order to maximize company profitability. Implement your findings into all Q4 campaigns. Maybe you read about Amazon encouraging folks to write smaller e-books, texts that can be digested in an hour or two. As you know, I test different book formats, blog content, and project concepts all the time ... it's hard to be successful without testing stuff. You might be interested to see "what works", based on the content I'm publishing. 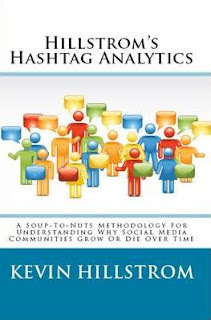 Hashtag Analytics is just 40 pages ... $7.95 in print, $2.99 in Kindle format. It's easily the best selling of the booklets I've published. 82% of the sales are in the Kindle format. 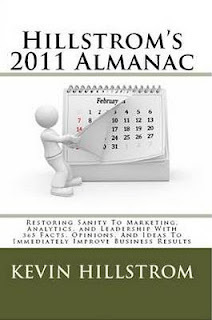 The 2011 Almanac is 174 pages ... $14.95 in print, $7.95 in Kindle format. It's a distant second in books sold this month to Hashtag Analytics. 67% of the sales are in the Kindle format. Hillstrom's Catalog Marketing PhD is third in books sold, but has led to consulting projects that truly pay my bills. This booklet is 44 pages ... $7.95 in print, $2.99 in Kindle format. Only 12% of the sales are in the Kindle format. The audience that appreciates this booklet tends to like paper ... and that should make sense if you're trying to sell a Catalog Marketing PhD to somebody. Here's what I've learned, so far. The number of pages in the book/booklet are meaningless, it's about providing interesting content. The content dictates the distribution platform. It should surprise nobody that a booklet about Twitter sells digitally ... while a booklet on catalog marketing sells in print. Price doesn't seem to matter much, as long at the price is in a reasonable band. One would think that a $2.99 price on Kindle would dramatically outperform a $7.95 price point, and that hasn't been the case in my experience. You do not sell books if you do not promote them. I've learned that books sell best off of my homepage, followed by my blog, followed by Twitter ... with the exception of Hashtag Analytics, which sells well when folks in the Blogosphere mention the book. Books = Consulting Projects. As a consultant, you don't sell the books hoping to make $72,000 on book sales alone ... the books provide an avenue for you to share a thesis with your audience, and that leads to folks hiring you for projects. 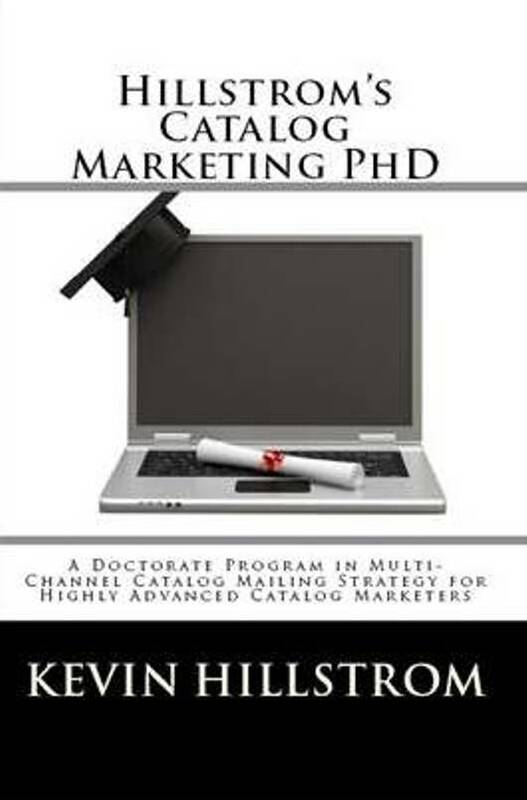 In particular, the Catalog Marketing PhD book, and the Multichannel Forensics book from 2007 served that purpose. As a marketer, it's important to consider the interaction between content and audience. The digerati tell you that you must have a mobile and social media presence. Well, that's fine if your audience wants that from you. My Catalog Marketing PhD audience, for instance, doesn't care for a digital presence, while my Hashtag Analytics audience demands the digital channel. Not surprisingly, content+audience dictates channels, not the other way around. There's been a few questions in recent days about what you get when you sign up for various consulting projects. Hopefully, this will clarify things for those of you looking to hire me this Spring. Target Audience: Catalog CEOs, Catalog Marketing VPs. Average Cost: Logarithmic Curve, $7,500 for small businesses, $75,000 for Wal-Mart. Average Gain: A $50,000,000 business (housefile) will see $300,000 to $500,000 of annual profit, on average. A few cases push to $1,000,000 or more, contact me for references. In other words, it is typical to generate 20 times as much profit, per year, as you pay for the cost of the project. That's a sweet deal, folks! 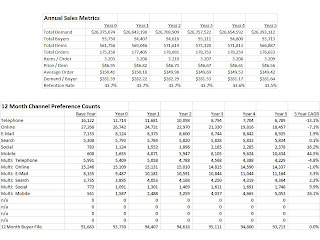 What You Get: Rolling twelve-month analysis of growth by channel, Multi-Channel Forensics analysis of each physical/ad channel so that you understand how all of your channels fit together, Digital Profile segmentation analysis, prediction of twelve-month profit by customer, calculation of "organic percentage", the amount of demand not generated by catalogs, prediction of twelve-month profit generated by catalogs, Forecast Forensics that tell you what you must do to grow your business in the next five years, and a customized catalog contact plan for each individual customer for the next year --- telling you exactly how many catalogs to mail each customer to generate optimal company profit. Average Cost: Logarithmic Curve, $5,000 for small businesses, $40,000 for Wal-Mart. Average Gain: Determined by how the client chooses to use the results. What You Get: Digital Profile segmentation analysis, yielding sixteen or more actionable segments that comprise channel preference (e-commerce, e-mail, search, affiliates, social, mobile), merchandise preference, geographic location, lifestage/psychographic/demographic information, credit information. Digital Profiles are most often used to analyze e-mail campaign performance and to target customers for specific e-mail versions ... project results are also used to analyze online item performance by Digital Profile. In addition, client gets Forecast Forensics, which tell the CEO/EVP what must be done to grow your business in the next five years, by channel. 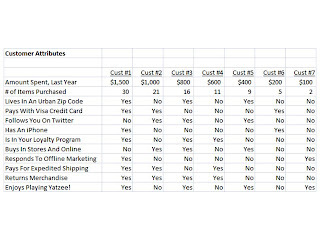 Average Cost: For the first three clients, $3,200 for existing clients, $3,900 for new clients. Prices are likely to increase after the first three clients are accepted. What You Get: A spreadsheet that predicts where your business is headed, given various advertising strategies by channel, various retention strategies, and various new customer acquisition strategies. You will obtain predictions, by channel, for total sales over the next five years. You will be able to simulate different strategies (i.e. doubling your e-mail frequency, increasing your search budget, ramping-up your mobile strategy), and you'll be able to see where your business heads as a result. I anticipate this will be a popular project among E-Commerce Executives struggling to understand the impact of mobile/social on their business. I anticipate this will be a popular project among Catalog Owners looking to sell their business in the next year. Please e-mail me with any questions you have, I'll be happy to answer them for you. We're going to begin a new topic here on The MineThatData Blog. Starting next Thursday, we will spend one day a week talking about "forecasting the future". I am calling the series "Forecast Forensics". Over the next several weeks, I'll explain what "Forecast Forensics" are all about. Many of my clients already enjoy a version of Forecast Forensics as part of their Catalog PhD project or Multichannel Forensics project. In this case, the entire project is designed to let the CEO, CFO, EVP, or VP of Marketing predict the future. We analyze a series of offline purchases, online purchases, mobile purchases, and purchases attributed to social media. The data is structured in a manner that allows the business leader to understand where the business is headed, over the next five years (click the image below to make it more readable). What will my sales look like in five years? Will emerging channels (mobile) cause the cannibalization of existing channels (e-commerce)? What impact will search have on my business over the next several years? What happens when I double my e-mail contact frequency? What happens when I eliminate my e-mail marketing program? Does social media truly contribute to the bottom line? How will my customer base evolve and change over time? How many new customers do I need in order to allow my business to grow? What has to happen to my retention rate in order to get my business into high-growth mode? What happens to my business if the economy plunges by 5% this year? What is the growth potential of my business, given that I'm thinking of selling my company? The price is right if you are an e-commerce executive, retail business leader, an owner of a catalog business, or a small business owner. First three clients to sign-up: $3,200 for existing clients, $3,900 for new clients. Prices are likely to increase once three clients sign up. Over the next few months, we'll talk about Forecast Forensics each Thursday, so that you can see what the methodology is all about ... we'll explore the questions outlined above in greater detail. In the mean time, if you're one of the first three to sign up for a project, you get a really good deal on a valuable forecast tool! The start of 2011 has, once again, energized the multi-channel community. Except this time, it's a different multi-channel community. From 2000 - 2009, we heard catalogers and retailers (especially the vendors that support this audience) beat us over the head with the "integration" theme. They told us that we had to offer the same items, at the same prices, with the same level of customer service, using the same creative. For so many, this was more of an argument over control than a thesis for increasing sales among loyal customers. We so quickly forget the climate a decade ago --- we had an online channel being run like it was the "wild west", whereas we had offline channels that were required to generate the sales and profit necessary to allow investments in the online community. We had a divided marketing world. The "multi-channel" message was largely an attempt to exert control over an online world that had, to some, gone off the rails! A decade later, we know that the multi-channel mantra was largely unrealized. Retailers who integrated everything, outside of a small number of exceptions, did not realize sales gains. Customer spend, when measured on an annual basis over the course of a decade, was unchanged, and after accounting for inflation, often decreased. I am not saying you shouldn't integrate everything ... inventory, marketing, channels, strategy, you name it. Go ahead and integrate everything. But don't do it because you are being promised that sales will increase ... you're not likely to experience a 17% sales increase on a sustained, annual basis ... you might milk one campaign for a 17% sales increase, but it isn't sustainable over the long haul. Integrate because it is right for your vision of customer service. I bring this topic up because, in 2011, the integration mantra is being rammed down our throats by the vendor and pundit community, once again. This time, it isn't about integrating offline and online ... no, it's about integrating online/search/e-mail/affiliates with mobile and social. A decade later, the online audience that fought with the offline audience for marketing freedom is asking the mobile/social crowd to integrate, repeating history. The trend is clear. Incumbent channels preach the integration mantra as a means to gain control over upstart channels. Now, this may be exactly what is needed within your business. Or, your customer may not give a whiff about integration ... she may want to buy $50 of carrots for $20 from Groupon, then want to buy $50 of carrots for $50 in your e-commerce channel. The key, of course, is to understand what your customer actually wants, not what your marketing vendor wants for your customer. Analyze customer behavior, and learn for yourself if your customers want a seamless, integrated experience or an experience that is unique and exciting within each channel. The social media community and online analytics community do a great job of measuring things. They can tell you, for instance, that @michelehinojosa (a popular individual in the #measure community), is influential or not influential, they can score her based on all sorts of criteria. For some reason, nobody seems to want to answer a different question ... "What would happen if you removed @michelehinojosa from the community?" That's what we're going to explore today. Recall, this is a five-week forecast for the #measure community. Now, let's have some fun. We'll remove any activity associated with @michelehinojosa from the community. Then, we re-segment all users, and we produce a forecast for the next five weeks, without @michelehinojosa participating in the community. This user has a profound influence on the community. Let's look at the base week, week zero. Two users other than @michelehinojosa would not exist in the community without her input. Times users are re-tweeted with her = 253, without her = 233. Times users are answered with her = 64, without her = 60. Total tweets = 747 with her, 703 without her. In other words, this user provides about 7% of the "oxygen" that carries this community. And as we forecast her influence into the future, we see the same thing ... 5% to 6% of the "oxygen" is provided by this user, going forward ... the influence diminishes a bit as new users enter the community. Let's look at another user ... @immeria. This fine young man has a different type of impact on the community. He impacts more users ... without his participation, about 2% of the community no longer participates. He does not impact the total oxygen of the community as much, in other words, he doesn't impact the number of tweets or number of conversations. But he does bring along 2% of the community. And his impact lasts through the forecast cycle, meaning he impacts new participants as well. This exercise can be run for every user in a community. 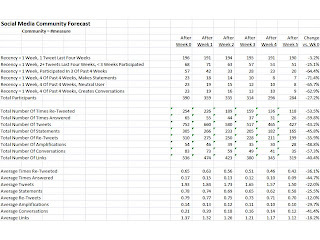 We can easily forecast what impact each user has on the overall future of a community. By looking forward, we get to see what might happen, and we can take steps to change the future. When we simply look back into the past, we only measure what happened in the past. 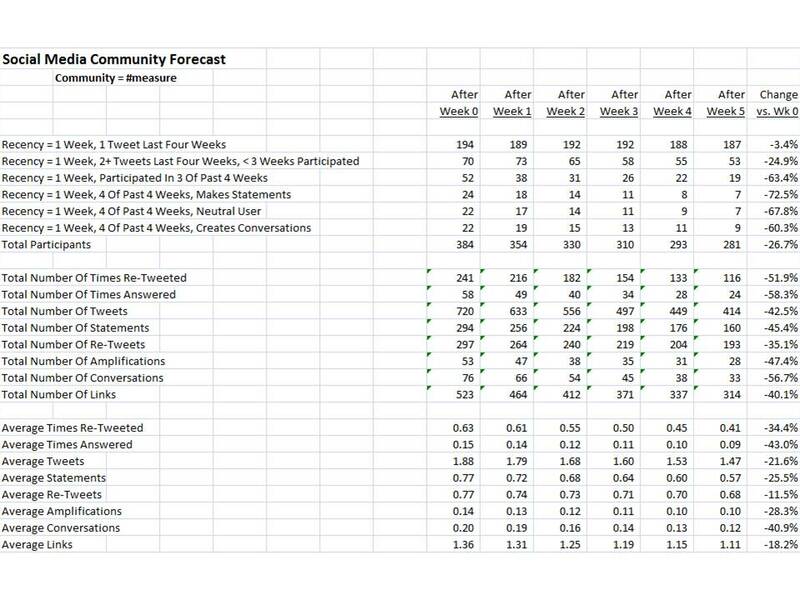 In this simple example, when we remove just two users from a community of about four hundred weekly participants, we lose close to 8% of all future activity in this community. In spite of a ton of new users, these two folks, @michelehinojosa and @immeria, foster a wonderful and vibrant community. That's a decent measure of influence, don't you think? 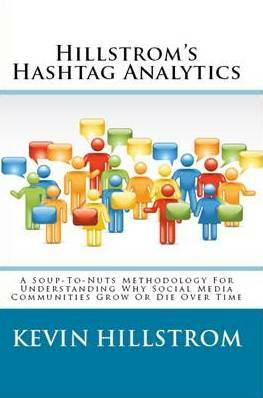 If you want to learn more about Hillstrom's Hashtag Analytics, give the booklet a try. It's one of the top forty direct marketing books currently available on the Kindle platform!! Purchase Via Amazon, Print: $7.95. Purchase Via Amazon, Kindle: $2.99. Hire Kevin For A Project: Click Here. You probably read the press release this morning about JCP finalizing the elimination of their catalog marketing channel. JCP states that elimination of the catalog channel will cause annual profit to increase by $25,000,000 to $30,000,000 per year. That's a lot of profit, folks. Catalog marketing is in a peculiar place. For some, the catalog is now meaningless. Truly, it is. Your attribution/matchback models tell you that the catalog means everything ... your mail/holdout results tell you that the catalog is no longer profitable. You know that only 5% of your new customers come from catalog marketing. For others, the catalog means everything. Truly, it is. Your attribution/matchback models tell you that the catalog means everything ... and your mail/holdout results tell you that the catalog is vital. You know that 70% of your new customers come from catalog marketing. Do not listen to the print-based industry or your co-op ... they have a vested interest in proving that catalog marketing works. Do not listen to trade journal blogs that say sensational things to attract readers ... they have a vested interest in using news from catalog companies to generate profit for their business ... without you, they are unprofitable. Do not listen to the social media elite or the digerati ... they have a vested interest in promoting new technology as a solution to anything. The only way you know for sure is to execute mail/holdout tests. Your customers will tell you, honestly, if catalog marketing "is" the brand, or if catalog marketing represents an aging component of a modern brand. I do have a little experience in this matter, give me a holler if you'd like help with the process! When we chat, we inevitably talk about search, a channel that was top-of-mind during the Google-infused pre-recessionary environment of 2004. Half of the discussions exhibit a contempt with search, including comments like "it doesn't work" or "I'm not paying Google one more penny." Half of the discussions include comments like "it's a fantastic way to acquire new customers" or "we convert existing customers through search". Those of you who run mail/holdout tests probably know the answer. Take a look at this test, run for three months. Look at the "Search" column. Let's assume that we're focusing on Paid Search here, though Natural Search can be analyzed as well. When you see something like this ... a case where the mailed group outspent the holdout group in search, it tells you that YOU MUST EMBRACE SEARCH. It means that your catalog drives customers to Google, for whatever the reason. When you see that the mail group and the holdout group have the same spending levels (say $5.00 in each row), then search takes on a different role. It means that the customer does not use search as part of the catalog marketing process. Here, you may or may not need to embrace search. Holdout tests will tell you the answer. Ask your Chief Marketing Officer for a report, just like the one illustrated above, that will tell you how catalogs and search interact with each other. How often have you heard quotes like this? "Multi-Channel customers are the best customers." "Your best customers participate in Social Media, so you have to join the conversation so that you can reap the rewards." "The biggest spenders love loyalty programs, so you need to reward best customers to remain competitive in today's highly complex retail landscape." Putting these comments up on Twitter is like throwing an aerosol can into a bonfire. BOOM!! The comments go viral, they're accepted without any analytical rigor. Folks seldom question the data, because the comments sound so darn logical that they must be true. If you have access to customer data, you can do some research on your own. And when you do some research on your own, you learn about a curious pattern that happens when drafting simple queries based on "best" customers vs. all other customers. Look at the data in the table at the start of this post. Let's query the table. We'll calculate the average amount of spend a customer had if they possess the attribute, and the average amount of spend the customer had if the customer does not possess the attribute. Here we go. Yes = $900. No = $475. Strategy: Find urban customers, because urban customers are your best customers. Or encourage your customers to move from a rural environment to an urban environment, because they will spend $425 more if they move, based on your findings. Strategy: Partner only with Visa on special promotions, ignoring all other tender types, because Visa purchasers are your best customers. Or offer a promotion to get AMEX customers to switch to Visa, because you'll benefit from the switch. Yes = $733. No = $600. Strategy: Give discounts and promotions to Twitter followers, because those are your best customers and they will evangelize your brand for you. Yes = $850. No = $580. Strategy: Ignore Android and focus only on Apple, because your best customers love Apple. Apple customers outspend other customers by $270 each. Or better yet, encourage Android customers to switch to the iPhone, because it will benefit your brand. Yes = $967. No = $425. Strategy: Get all of your customers to participate in your loyalty program, because customers in the loyalty program outspend non-members by more than $500. Strategy: Fully invest in a bricks 'n clicks environment like Borders or Blockbuster, because your best customers shop multiple channels. Yes = $800. No = $600. Strategy: Develop a catalog marketing program that is targeted to your best customers, because best customers love receiving paper in their mailbox. Or try to force your customers to shop from a catalog, because they will become better customers. Explore television commercials, billboards, and radio advertising as well, because your best customers are offline mavens. Yes = $1,033. No = $375. Strategy: Force all customers to pay for expedited shipping, because when you do that, you end up with customers who spend 2.9 times as much as customers who don't pay for expedited shipping. Customer Returns Merchandise For A Refund. Yes = $975. No = $233. Strategy: Give a customer $10 off their next order if they return merchandise today, because customers who return merchandise spend $700 more than customers who don't return merchandise. By providing a financial incentive to return merchandise, you will increase customer value. Yes = $700. No = $600. Strategy: Send every customer in your database a free Yahtzee! game, because customers who possess a Yahtzee! game outspend all other customers by $100. 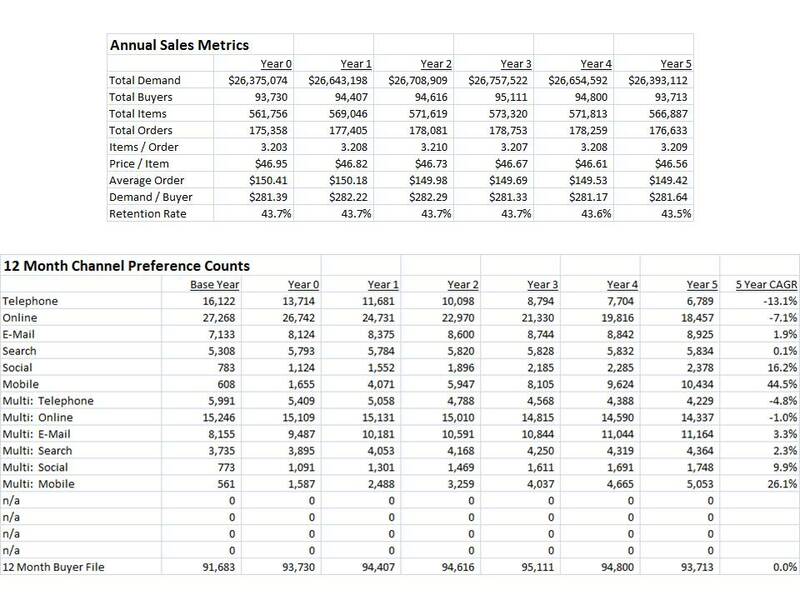 Have you ever attempted this analysis in your own customer database? It's a fascinating analysis, because for 85% of the attributes you analyze, you'll find that customers who possess the attribute outspend customers who do not possess the attribute. It's a mathematical "dilly of a pickle", if you will ... it turns out that your best customers tend to do everything, and that skews the results, causing nearly every query to exhibit a "best customer bias". Seriously, go perform this analysis on your own customer database. 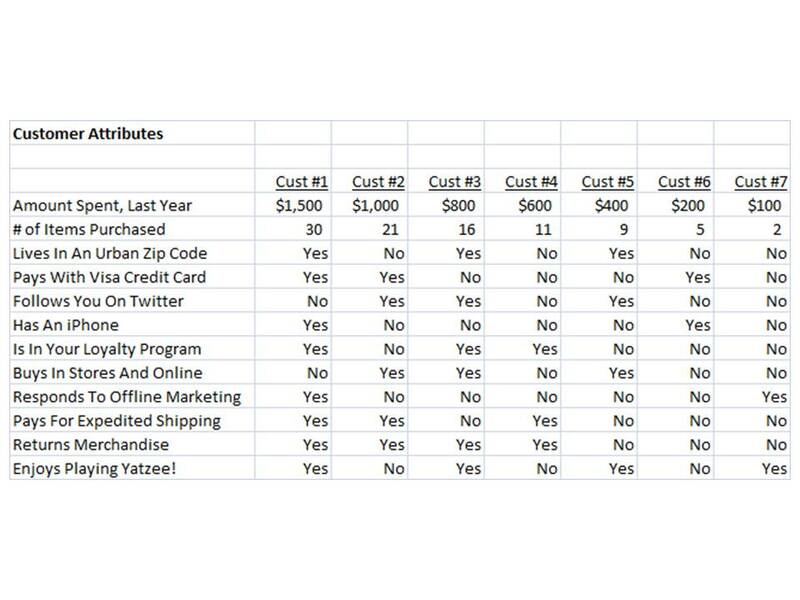 If you're a vendor, go run this analysis on your customer base, you'll see the same thing. "Best Customer" analytics that depend upon simple queries provide highly misleading results ... in fact, the outcomes are utterly impossible to decipher. And you know this is true. If it were not true, then you would have capitalized on all of the ideas that you read in trade journals, blogs, Twitter, you name it, and your annual retention rate would have increased from 45% to 60%, right? But you go back a decade, and you see that you've added channels and loyalty programs and advanced analytics and increased online spend and participated in offline marketing programs and social media and mobile and ... well ... you haven't increased your retention rate ... and spend is up at an inflationary rate. A better, but more complicated analysis, is to pick a period in time (say January 1, 2010). Freeze customers as of 12/31/09, tabulating customer attributes at that time. Then regress all attributes (like the ones in the table above) against spend during 2010. If the coefficient for an attribute is significant and positive, then you know that the attribute contributes positively to future spend. I know, it's humbling to know that everything you've been taught isn't yielding profitable increases in customer retention. It's frustrating to know that the secret to success is having a profitable customer acquisition program. Run your own analytics against your own customer database, and learn for yourself why traditional "best customer" analyses are hopelessly flawed. Well, I've been pummeled with comments over the past two days. What do you think of the LivingSocial / Amazon deal? That one worked, huh? I guess you were wrong about social commerce, Amazon just proved that it works! You have to keep in mind that Amazon invested in LivingSocial, so it is a win-win. You have to understand that this is how modern marketing works. You have to give people something of high value in order to grow your business. Even Snooki tweeted about this, so it really did work. You really don't know the financial arrangement between the two companies, so it could work. Since Amazon owns a part of LivingSocial, it probably nets out at no-cost for Amazon. Why are you against social commerce? Why do you hate promotions? They work, customers love them, and they help brands grow. Discounting doesn't hurt loyalty ... look at Woot, they have great customer loyalty and they do discounts as well as anybody. Many of the comments are valid. Twitter and Blogs have changed how we evaluate whether a marketing strategy works. Today, something works if it is Popular, and if it is backed by a Strongly Worded Opinion (SWO). Actual Data > Popularity + Strongly Worded Opinions. In many companies, the Marketing head and the Chief Financial Officer sit down with a pen and a pad (or even a spreadsheet). They run a series of scenarios. They ask critical questions. If we give away $13,000,000, how will we get our money back? Will we get our profit back in the short-term, or in the long-term? Will the promotion generate new customers, or will we have to find a way to get profit from existing customers? No matter what the relationship is between Amazon and LivingSocial, $13,000,000 (less those who do not redeem the promo) just vaporized. You cannot ignore this fact, no matter how many Strongly Worded Opinions are offered, $13,000,000 just disappeared. This isn't the Fed, folks, we can't quantitatively ease our way into generating $13,000,000, we'll have to do hard work to get it back. And it is possible to get the money back. Here's a scenario where we more than make up the costs of the promotion. I assume that customers will spend 50% more than the $20 gift card they purchase for $10, I assume that 30% of the purchases would have happened anyway, without the promotion (yielding a 70% incremental rate). I assume net sales, gross margin, and pick/pack/ship percentages based on publicly available information and 10K statements. I make very crude assumptions for new/existing customers, and for 12-month profit estimates. I assume that by improving an Amazon buyer from 10 purchases to 11 purchases, you increase long-term profit from those customers by $2. If you don't like the assumptions, choose your own and run your own numbers!!!!! If I can show that the net relationship is profitable, then I support the promotion. That's the point of all of this. Demonstrate that it is possible, or even probable, that the twelve-month payback of a promotion is greater than the money lost running the promotion. Do the math. This isn't calculus, this is simple math ... addition, subtraction, multiplication, division. And when you run the math, you may be surprised to learn that your Strongly Worded Opinion is, in fact, correct! Old School: It's 1994, and I'm working at Lands' End as Manager of Analytical Services. For the past year, I helped execute and analyze results of a test to measure the impact of every business unit on each other. We just finished executing the test ... fifty-two weeks of a 2^7 factorial design that yielded 128 test segments and countless tidbits of information on how customers shopped. I expected to complete the results of the analysis in a couple of months ... after all, I had a day job to do, so I set an arbitrary analysis completion date. Nobody in Management complained about the deadline I set, so I believed that all was good. And then I'm listening to our business head tell an individual that, in seven days (the following Thursday), she was meeting with all business heads to discuss how to strategically approach the marketing of each business unit in 1995 and 1996. Three thoughts came to mind. I wasn't invited to the meeting (nor should I have been, I was a lowly Manager). My data wasn't going to be shared at that meeting. The entire reason we executed the year-long test was because we wanted to determine how to strategically approach the marketing of each business unit in 1995 and 1996. What to do ... what to do ... what to do? I spent the entire weekend compiling the results of the test. I ignored every geeky metric that existed ... you know, stuff like significance tests and p-values and confidence intervals and all that stuff. I pretended that I was a business head ... what did this person what to learn, or more important, what did this person need to learn? I met with an Executive in the Finance department ... I played basketball with this person three times a week, so I felt comfortable asking this person for detailed financial information about each business unit. After sharing my presentation with him, he showed me how to calculate a full profit and loss statement for each business unit ... with catalog mailings or without, after accounting for all fixed and variable costs. This was a really important step, because profit data told a story that couldn't be easily inferred with standard KPIs. The story that I needed to tell could not be properly told or understood without profitability data. I ended up with eighty (80) Powerpoint slides. I still didn't have a forum for sharing the results. I hastily arranged a meeting for the following Wednesday (the day before the meeting with the heads of each business unit), inviting my department head, the other Managers in my department, and the folks who helped me execute the test. On Wednesday, I printed color copies of the presentation (color copies were a big deal in 1994), handing out eighty pages of hard work to each Manager. Our meeting was at 2:00pm. Our department head didn't show up ... and that's a bad thing, because this person needed to see the results, because she was the only person invited to meet with the department heads. I started the meeting at 2:00pm, regardless of her lack of attendance. At 2:50pm, as I was wrapping up slide #74, our department head entered the room. As I finished presenting the final six slides, our department head fast-forwarded through the content she missed. I ended my presentation. Our department head told our team that the information in the test was exactly what she needed to share with all department heads, and that, amazingly, there was a meeting the very next day with all department heads to go over strategy for 1995-1996. What a coincidence! She asked me to attend the meeting, and asked me to present the slides to the CEO and all business heads. I accepted her invitation. The next day, I presented the findings of the year-long test to a room split by the results of the tests. Needless to say, the discussion was spirited, an eye-opening experience for a twenty-nine year old who had not previously had an opportunity to participate in a meeting of this magnitude at a billion-dollar a year company. Modern Application: Give Twitter a read, and you'll see analytics experts providing tips and techniques for success. We're taught how to execute a test, how to measure significance, how to avoid pie charts, how to create a dashboard that outlines the findings. We're almost never told about listening, timing, and permission. First, keep your ear to the ground. This isn't about gossip, this is about taking the temperature of your organization. What are people wondering about? Do you have answers for the questions people have? Do you have a forum for providing the answers? I can't tell you how important it is to listen. Listen to Executives. Listen to Directors. Listen to Customers. Listen to the CEO. Listen to the CEO's Administrative Assistant. Practice taking action, based on what you hear. You're not going to be perfect. I tried the exact same approach in 1997 at Eddie Bauer ... and it was a disaster. There aren't "Six Easy Steps To Getting A Seat At The Executive Table". You try things, you learn, you adapt. View it like a free throw shooting percentage in basketball ... shoot 60% this year, then 70% next year, then realize it's going to be very hard to ever shoot 75% or better. Second, be savvy ... timing is everything. If I complete the work just before the approved deadline, it's entirely possible that the work never sees the light of day. Know when your Executive team has scheduled meetings. If you don't have a relationship with your Executive team, initiate a relationship with the Admin who supports the Executive you want to work with. The Admin knows when important meetings are scheduled, the Admin knows when weekly meetings are held and who attends those meetings. Hand-deliver your results to the Admin ... don't rely on Executives to visit your fancy intranet site, don't expect an Executive to review your important, KPI-loaded customer analysis dashboard. Take matters into your own hands. Tailor your projects around key Executive meetings. At Eddie Bauer, in 1997, there was this thing called a "QPM", or "Quarterly Planning Meeting". Once a quarter, all Executives got together to discuss the performance of the business. Not surprisingly, I tailored delivery of all important analytics projects within one week of this meeting. Timing is everything ... you are marketing yourself, you are defining your "target audience" and you are marketing to your target audience when the target audience is most receptive. Third, permission is flexible. I know that's a hard concept to accept, but permission is truly flexible. I didn't have permission to obtain company financials, heck, those numbers were never shared with anybody ... but I had data that the Finance Executive loved, I gave the Finance Executive first crack at seeing the results, and I had a prior relationship with this individual, so I obtained information critical to the story I was telling. Furthermore, I did not have permission to attend an Executive meeting, so I had to create a forum that would grant me the permission I sought. Use best practices to create a spectacular analysis. Publish your findings via a dashboard, utilizing KPIs that measure ROI. When Executives don't accept your findings, beat the Executives up for being Luddites.